As you are aware, the GDS Committee headed by Shri Kamlesh Chandra, Retired Postal Board Member, has submitted its report to Government on 24th November 2016. Secretary, Posts, informed us that the report will be published only after getting approval of the Minister, Communications. Earlier, GDS Committee Report was published on the very same date of submission. 7th Pay Commission Report was also published immediately on submission to Government. Protesting against the unjustified stand of the Department, NFPE & AIPEU-GDS conducted nationwide agitational programmes like protest demonstration, dharna etc. Finally we have given notice for indefinite hunger fast in front of the Directorate from 18.01.2017, by Secretary General, NFPE and all General Secretaries of affiliated Unions including AIPEU-GDS. After our hunger fast notice things started moving. Secretary, Department of Posts deputed a Senior Officer to the Minister’s office to get the approval of the Minister. Minister granted permission to publish the Report with a condition that Election Commission’s approval should be obtained before publishing the Report, as Election Commission has already declared election to five State Assemblies. On 16.01.2017, the Department called us for discussion with Member (Technology). In the discussion Member (T) informed that “a reference has been made to the Election Commission of India (ECI) and a response is expected shortly”. We recorded our strong protest against the unjustified delay in publishing the report. The Member (T) expressed “the difficulty in hosting the report in the Department’s website on account of the enforcement of the Model Code of Conduct in view of assembly elections having been announce in five states”. 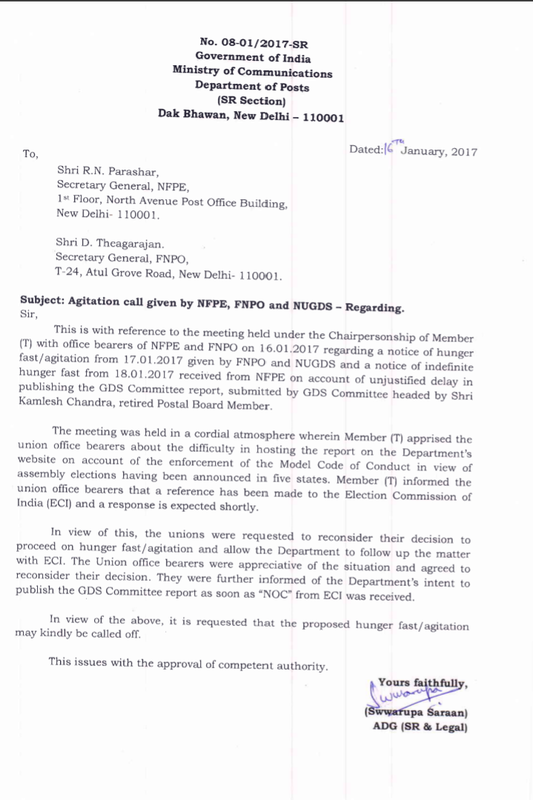 The appeal given by the Department to call off the indefinite hunger fast is published below. In view of the above, the Federal Secretariat of NFPE and AIPEU-GDS has reviewed the situation based on the written assurance given by the Department and has decided to postpone the indefinite hunger fast to be commenced from 18th January 2017. Even if we go on indefinite fast or strike, Department cannot publish it without the permission of Election Commission, as the Department has already submitted it to Election Commission for permission. We hope that the Election Commission will grant permission shortly to publish the Report. NFPE & AIPEU-GDS has made sincere effort for compelling the Department to publish the GDS Committee Report and conducted nationwide agitational programmes. It is only because of our agitational programmes and indefinite hunger fast notice, the Department was compelled to get permission and also submitted it for Election Commission’s approval. NFPE & AIPEU-GDS always stand with the three lakhs Gramin Dak Sevaks and we assure our GDS employees that if GDS Committee Report is against the interest of the GDS NFPE & AIPEU-GDS will declare serious agitational programmes including strike.